So here's Paris Part Godzillion to my blogposts on my December 2012 trip to Europe! Anyway we first headed to the Catacombs! I don't think it's that well-known a tourist attraction maybe due to its slightly morbid nature, but we thought it would be interesting. The Catacombs hold the remains of around 6 million people! And the underground network is really pretty extensive. Sarah & Caroline! Just to recap, Sarah is my friend from Singapore who was doing her NUS student exchange in Munich so I met up with her to travel together, while Caroline is a backpacker from Australia who was sharing the same dorm room as us. The bunk below mine in fact haha. At hostels it's really very easy to meet people! That day another Australian joined us as well. We had to walk through many long tunnels before we got to the actual catacomb area with the bones! Road name for the underground network I guess. Carvings into the stone wall. Odd blue pool of water! Andrew, another Australian backpacker! We happen to chat at the hostel & realised he was planning to go to the Catacombs too so he came with us. He left halfway to catch a flight to another country! "Stop, it is here the empire of death"
I'll provide basic translations of what everything says but don't expect it to be super accurate because I'm lazy haha. E.g. some direct translations may sound weird in English & I won't bother rectifying that. "You are invited to not touch anything and to not smoke in the ossuary"
This is Latin so... Google: "In memory of our ancestors"
It's pretty... odd.. to be in such close proximity with human remains. On one hand they're just... there. So easily accessible, touch-able & somewhat... unimportant because there's so, so, so many & they are just piled one on top of the other without any significance to them. They are completely depersonalised & are somewhat to seem like just mundane scenery. Yet at the same time these once belonged to people just like you & me, with families & memories & normally parts inside your body are sacred. It's just endless corridors & corridors of bones & skulls. I think the white powder is... calcium deposits? "They were what we are. "Bones from the hospital La Trinité road St Denis and Greneta, the 6 January 1814"
"Silence, mortal beings" - "Vain grandeurs, silence"
No one will come and spill tears"
Just endless rows & rows & rows & look how deep it extends towards the back. Dry Bones, you will live again"
And we finally made our way out! I think walking through it took maybe around 1.5 to 2hours? It depends how slowly you go I guess. Next we headed towards Les Champs-Elysées! 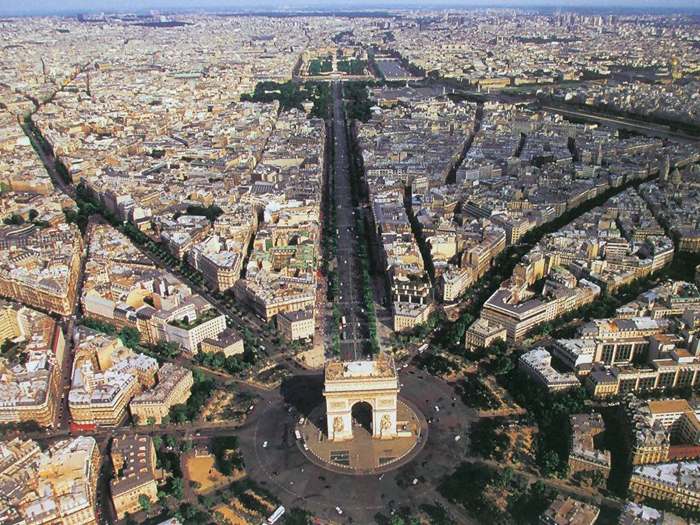 L'Arc de Triomphe is located at one end of it. Here's the Arc, sitting in the middle of a huge roundabout! The Arc as the sun started to set! Crossed over to the Arc via the underpass! The Arc is to commemorate those who died fighting in the French Revolution. The French Revolution is actually believed to have been the spark that spread ideals of democracy throughout Europe & then the world, making it one of the most important events in history. Finally reached the top. Dead. Went up to the rooftop! "The roundabout has 12 exits and is a massive quarter of a mile in diameter, which gives cars plenty of room to dash in at least 12 different directions at once. As a star, l'Etoile is part black hole, part supernova. Cars are sucked in, bounced crazily around, then expelled along one of the exits. Jean-Marie accelerated into the throng of vehicles, hardly blinking as his flash new car was almost cut in two by a kamikaze Kawasaki... He slewed on through four or five near misses, and I wondered how many seconds it would be before his apparently God-given luck ran out and I was chewing airbag... 'Insurance companies never investigate accidents at L'Etoile,' Jean-Marie explained. 'It would be like asking how a boxer broke his nose.'" One of my all-time favourite books! It's about a Brit moving to Paris & it's hilarious to me. But anyway yes, the driving in Paris is pretty crazy in general. So anyway, here are the sights at night! Look at the traffic below hahaha. There are no traffic lights, no lanes, no guidelines whatsoever & yet it works. I think a Singaporean driver would have a spazz attack & panic. The Carousel in the distance! Headed to some of the big departmental stores like Galeries Lafayette & Printemps. These stores actually basically just consist of counters/boutiques of high-end luxury brands (you'll find your Chanels, Pradas, Balenciagas... etc) so it's not really like the departmental stores we have in Singapore. Anyway both the 2 stores I named above are famous for their Christmas window displays! Every year all the windows are done up very elaborately & these are all MOVING displays. Spotted a small Ladurée counter so Sarah & I bought a big box of macarons because they're famous for them! The Ladurée flagship store along Champs Elysées is really popular & there's always a queue for both its normal pastries & confectionery as well as its sit-in dining area. Walked around & settled on a random restaurant for dinner! Disapproving Cat in a Santa suit is disapproving haha. Ok so those are my 72 pictures for Day 4 of Paris! The following day we left for Zurich, Switzerland. But before I blog about Zurich I'll show you guys how the hostel dorm looks like! 20 comments on "Paris - Catacombs & L'Arc de Triomphe"
I've a summer internship in Germany for 2 months. Intending to do some traveling as well. Do you think it's safe to travel alone in Germany and other countries in Europe? Yes like I mentioned, a lot of backpackers travel alone & it's easy to meet people at hostels. Soooo many pictures! Awesome! I would really like to visit Paris one day, it's such an interesting city. Those catacombs are so creepy. I wouldn't want to go there alone. Glad you went with friends. I love the poems on the wall. Love the Christmas cat too. What a scary place. They should have a PG13 sign in there. The bones are just soo... upclose.. perfect setting for the next mummy movie! So July is the beginning of summer in France? will it be hot? any sweater needed? thanks! going there this year.
? I didn't talk about summer at all in this post; I went in winter. Uh summer begins in I dunno, May? June? Standard summer season? You can Google for temperatures. France is large; temperature in the North is going to differ from the South. I sent an email to you at sophiewillocq@gmail.com. Was wondering if you have rec it? Didn't get it leh, checked my Gmail for your email & no results! How are the Laduree macarons in Paris? I tried them in New York and thought they were quite decent... though they weren't any better or more special than any other ones I've had. Heard they were frozen/imported from Paris, too--maybe I need to try them fresh at the Paris flagship store!! The Laduree ones in Paris are good! hey sophie!!!! may i know which camera you used to snap picture in paris??? was that casio? ;) I was thinking of getting a camera like when snaping pictures in the dark, the pics will not get blurryyy! thank you very much! !